What is a med chemist’s favourite phenyl substituent? In the course of preparing a talk for the recent ACS meeting (more on this later), I thought it would be interesting to give an overview of the ChEMBL data on substituted phenyls. 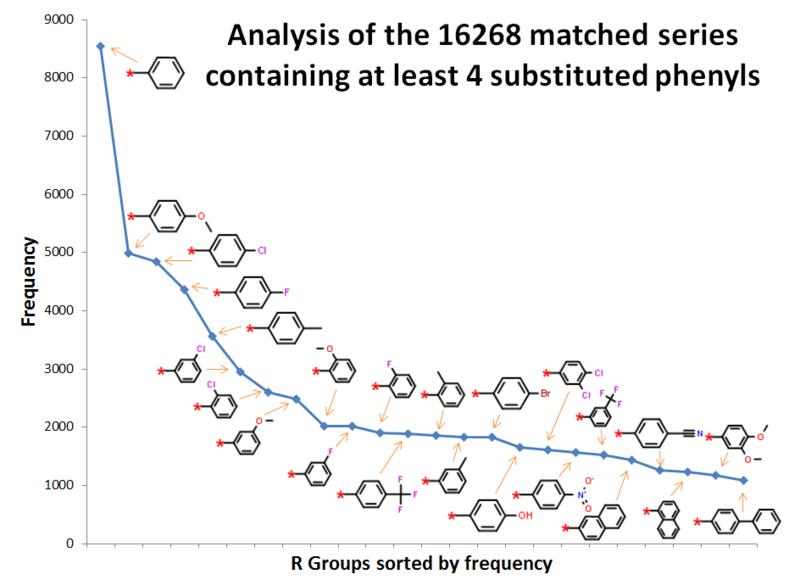 What I did was take all those matched series* with associated IC50 data containing 4 or more phenyl substituents, and then count the frequency of each particular phenyl. In other words, when a medicinal chemist was trying to optimize the substituents around a phenyl ring, which were the most frequent groups tested? The order of popularity at the 4 position is OMe > Cl > F > Me, while at the 2 and 3 positions it’s Cl > OMe > F > Me. 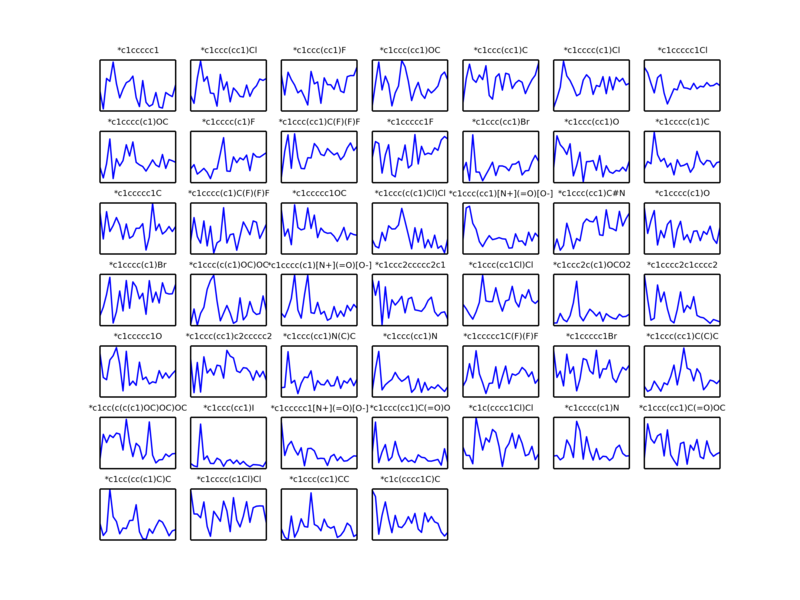 For these groups, in general the corresponding frequencies are in the order 4 >> 3 > 2. It would be interesting to know whether this corresponds to the ease of synthesis of these groups (in the general case) or whether other factors are at play. In response to a query about whether the preferences have changed over time, I’ve generated the following image (click for bigger) that provides this information for the period 1990-2013 (the x-axis). The y-axis shows frequencies divided by the total number of substituted phenyls that year. It’s a bit hard to draw any conclusions, but possibly 4-nitrile is becoming more popular, along with 3-F, while 2-NO2 and 2,3,4-OMe are going down. *A matched (molecular) series is a series of analogs with same scaffold but different R groups (all at the same position). In this context, each matched series contains only molecules from the same assay and paper. Posted on August 22, 2014 June 22, 2015 Author noel3 Comments on What is a med chemist’s favourite phenyl substituent? See you at the ACS? NextMovers will be present and presenting at the 248th ACS National Meeting in San Francisco, which starts this Sunday. Location: Moscone Center, West Bldg. Posted on August 7, 2014 August 7, 2014 Author noelLeave a comment on See you at the ACS?